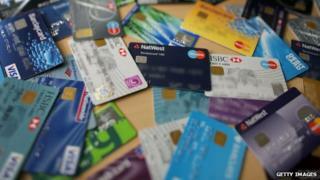 The UK's top financial regulator has accused the credit card industry of encouraging excessive debts. Martin Wheatley, the chief executive of the Financial Conduct Authority (FCA), said many people were struggling to manage their credit card bills. "Why are card issuers providing the means, in some cases, for the most indebted consumers to escalate their way into further debt?" he said. The industry responded by saying it was committed to responsible lending. Mr Wheatley's comments came as the FCA announced further details of its inquiry into the credit card market. The competition review will focus on whether the market is working effectively for consumers, and how providers treat vulnerable borrowers. It will start at the end of 2014. The credit card industry responded by saying it was committed both to responsible lending and transparency. It pointed out that credit card debt had fallen, while spending on cards had risen. "That said, we are not complacent about the small number of customers who find that changed circumstances, such as illness or redundancy, mean they need more support with managing their debts," said Richard Koch, the head of policy at the UK Cards Association. The FCA said nine million Britons were considered to be in serious debt, with so-called "survival-borrowers" using credit cards or payday loans to help pay bills. Mr Wheatley said that around one million of the the UK's 30 million cardholders only made minimum payments, so making little impact on the overall debt. "We know it's not uncommon for the most 'at risk households' to hold multiple cards and revolve multiple balances month-by-month," he said. The debt charity Step Change has said that many of those who visit them for advice come with five or more credit cards. On average such people have debts of £27,000 each. The consumer group Which? welcomed the FCA inquiry, and said there were a number of issues that needed investigation. Among them was the difficulty of comparing the interest rates of different credit cards. It also said information about charges should be made clearer. "Too many credit cards appear to be designed to catch customers out," said Richard Lloyd, the executive director of Which? "The FCA should investigate how lenders can help put consumers in control by providing clearer information, stopping excessive penalties and encouraging people to shop around without it damaging their credit record." James Daley, founder of consumer website Fairer Finance, said he thought the FCA would put an end to long-term 0% balance transfer deals. Such deals apparently offer good value for money, but often charge excessive fees. "0% balance transfers are available for as long as 31 months - but are only commercially viable if enough customers trip up," he said.